Bartenders are turning the table on traditional cocktails with a whole new way to add flavor to favorite libations. Nic Wallace vigorously emulsifies whole milk into fruit tea-infused vodka inside Mason jars on the polished wood bar at the River Bar at Sea Island. The concoction raises eyebrows among some guests, but one regular sees genius at work. “What’s The Mad Scientist making today?” he asks Wallace, the lead bartender. Fat washing incorporates a lesson in chemistry: infusing a fat-soluble compound into liquor which dissolves in the ethanol to extract flavor from the fat. The process is surprisingly simple. Any fat, whether solid (like bacon fat or butter) or liquid (such as oils), can be used. Solid fats, however, must first be melted. The fat is then emulsified into the spirit and placed in a freezer, which allows the fat to rise and form a seal at the surface of the liquid. Then, a hole is poked through the fatty seal (generally within a 24-hour period) and the liquid poured out. What is left is alcohol that embraces the intense flavors of the fat with just enough velvety texture to surprise the palate. That fat-washed alcohol can then be blended with other ingredients—like juices, syrups and liqueurs—to make a variety of creative beverages. 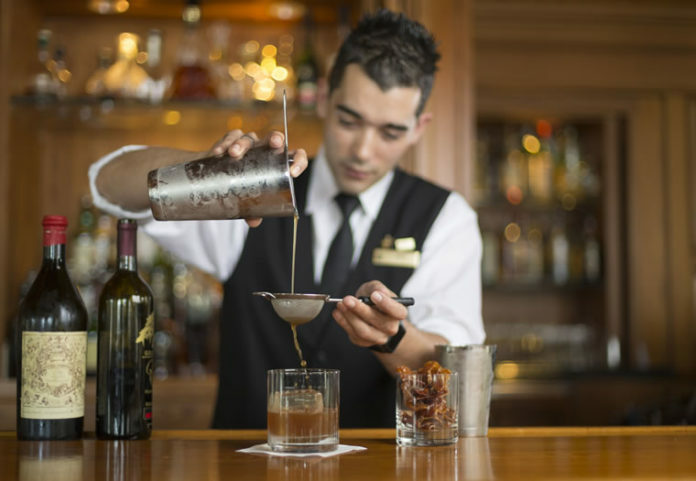 Bartenders across the country have experimented with a range of fat washings, from bacon-washed bourbons and sesame seed mezcals to olive oil cognac and peanut butter gin. The first time Wallace broached the concept of fat washing drinks with his team at the River Bar, the reception was fair at best. “I had to sell them on the idea before I could sell the customers on it,” he says. Some guests were skeptical at first, but were sold after the first sip. The concept may sound odd, but consider the flipside. For centuries, chefs have been creating meals using liquor, like cognac in steak au poivre, red wine in coq au vin, or rum in cherries jubilee. Fat washing simply turns the tables on this idea, creating a new dialogue between chef and bartender. “We realized we both have resources at our disposal,” explains Carl Jenkins, the bartender at OvenBird in Birmingham, Alabama, where he serves under chef/owner and James Beard Award winner Chris Hastings. At OvenBird, roasted bone marrow is an offering on the dinner menu. After the marrow has been removed from the bone for the dish, Jenkins uses the bone to prepare a cocktail called “Bigote de Lavanda,” which is Portuguese for “lavender mustache.” In a unique approach to fat washing, he pours a blend of Ilegal Mezcal Reposado, Spanish brandy, aged sherry and a house pecan demerara syrup down the center of the split bone and into a lavender-rubbed cocktail glass. Along the way, the dark brown liquid collects the flavorful remnants of marrow and fat. Like Jenkins, Wallace scopes out the menu at the Sea Island restaurant and asks the chef to save the discards from some of the dishes. His latest find was pork belly remnants, which he infused into coconut rum and topped with a candied bacon garnish for a cocktail he calls Confit. Add all ingredients to a shaker tin with ice, then shake and double-strain into the glass. Garnish with one long lemon curl and serve the drink in a small coupe glass. Add all ingredients to a shaker tin with ice, then shake and double-strain into the glass. 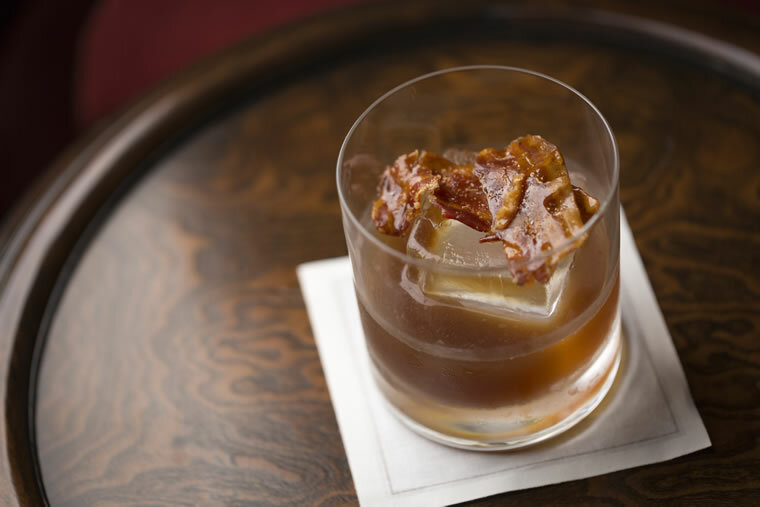 Garnish with one piece of candied bacon, and serve in an old-fashioned glass with one large ice cube.